Etter at Nike sluttet med golfkøller står Tiger Woods fritt til å velge utstyr. Denne uken har han nye jernkøller i bagen. Det er TaylorMade muscleback blades. Det blir spennede å følge Tiger Woods i Wells Fargo Championship torsdag til søndag. Han har sine spesielle tanker om hvordan jernkøllene skal fungere for at han er fornøyd. 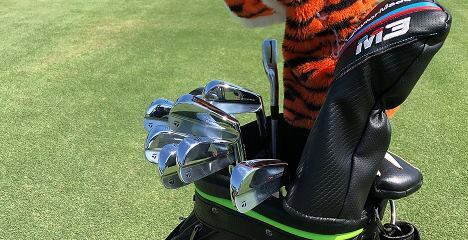 “We have been working closely with Tiger on the development, creation and refinement of a set of TaylorMade irons that meet his precise standards and preferences,” said a TaylorMade spokesperson. “As we continue to develop future iterations of Tiger’s prototype irons, ‘TW·Phase1’ marks Tiger’s initial transition into a TaylorMade set. This set was built to his meticulous specifications. Based on the positive feedback and excitement expressed by Tiger regarding upcoming prototypes, we are encouraged by the ongoing creation process and look forward to what’s in store for the next phase of Tiger’s irons.